Please proceed to read this topic all the way through, but also be sure to check out the Venus Fly Trap Dormancy frequently asked questions page. Many inexperienced Venus fly trap growers make the assumption that Dionaea muscipula are tropical plants and that they should be kept in warm growing conditions year round. However, the truth is that Venus Fly Traps are very hardy perennial plants. This means that they grow and bloom over the spring and summer and then die back to a small rosette every winter, growing back in the spring from their energy reserves saved up in the rhizome or root-stock. Venus Fly Traps go dormant naturally in the fall when growing outdoors. They can withstand frost and light freezes. However, freezes that last an extended period of time can kill Venus Fly Traps. In order for Venus Flytraps to survive long-term, they must have a dormancy period every year that lasts three to five months. Experienced growers report that a minimum dormancy period of 10 weeks is the shortest amount of time required for a Venus flytrap to grow well throughout the next growing season. Without a dormancy, Venus Fly Traps will weaken and die over a period of time. During dormancy, Venus flytraps still require as much light as possible in order to stay healthy. Unless placed in extremely cool conditions (less than 40°F) they should not be placed in a dark or low-light setting as this will almost surely end in death for a Venus Fly Trap. For growers in the extreme latitudes (zone 7 or lower), there are a couple of commonly-used options for over-wintering Venus flytraps. Some growers plant them outside in bog gardens and mulch them in the winter (more on this below). Others choose the Venus Fly Trap Fridge Dormancy Method, which requires allowing the plants to enter dormancy naturally before storing them for the winter months. It is fine to allow your Venus flytrap to experience fairly warm conditions during dormancy as it seems that photoperiod, over temperature, is the more driving force for triggering dormancy in Venus Fly Traps. As the days begin shortening in the fall, Venus fly traps will start shedding their summer leaves. As the temperatures drop, their growth will slow. 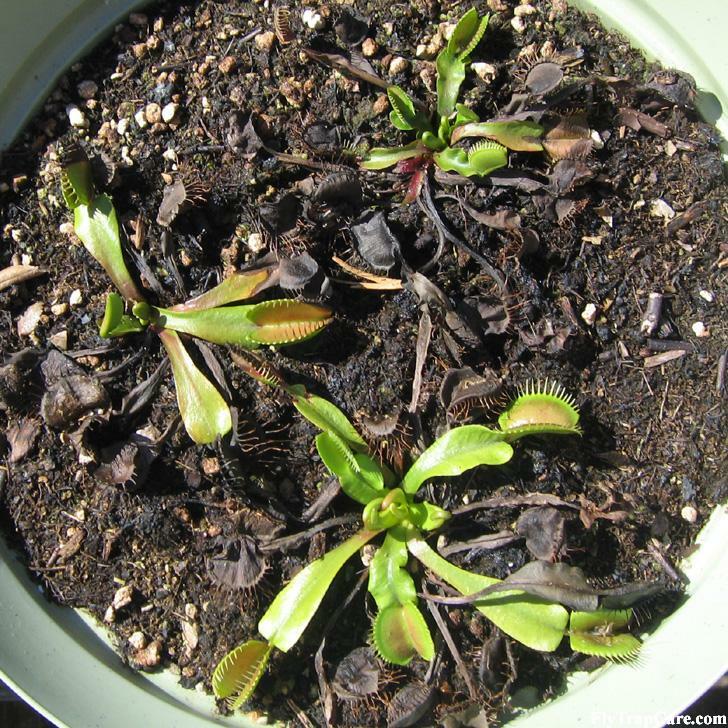 Flytraps will put out smaller, lower, ground-hugging leaves through their dormancy period provided that the weather isn’t too harsh or too cold. A dormant Venus Fly Trap isn’t very pretty. In fact, most people who don’t know that Venus Fly Traps enter a dormant period would think that the plant is dying. I have read on more than one occasion that people have thrown out their plant as it was entering dormancy, mistakenly thinking that it was dying. Most of the leaves turn black and the plant pretty much stops growing, at least to the observer. Click on the photo to the right to see a large image of three Venus fly traps in dormancy (actually just awakening from dormancy). Notice all of the dead leaves. During dormancy, the light and water needs for the Venus Fly Trap change slightly. Venus Flytraps should receive a reduction in water because the days are shorter and colder and, as such, the soil doesn’t dry as quickly. If kept too wet for too long, crown rot and/or root rot can set in, and mold can develop on dead or dying tissue. To prevent these potential problems, the media should be kept damp, not too wet, but absolutely never completely dry. Certainly not as wet as they are kept during the active growing season. As for light, Venus flytraps always prefer to have as much light as possible year-round to photosynthesize and create energy from the sun instead of “catching” it from insects. Given normal temperatures in their natural habitat, Venus fly traps will actually grow, even in dormancy, while collecting sunlight and turning it into stored energy to grow with in the spring. However, if they are put in conditions that are sufficiently cold (40°F or colder), Venus Fly Traps can go without light completely during dormancy as they enter a state of suspended animation. Obviously, this isn’t ideal. They would much prefer to have sunlight with which to grow throughout the year. I will go into the details of each of these options and the sub-options for each. This is the easiest and preferred method of taking Venus Fly Traps through dormancy. If you are one of the lucky people and you happen to live in a place where the winters are mild, in a hardiness zone of 8 or better (see the hardiness map below), then you can just leave your Venus Fly Traps outside year round unprotected. If they are potted in a small pot, you might want to consider bringing them in if there is one of those rare, extended freezes, but for the most part, they can be left alone and they will be very happy outside. If you live a hardiness zone between 4 and 7, it is possible to winter your Venus Fly Traps outdoors provided you take some extra measures to protect them. The plants will need to be planted in the ground in a bog garden or other soil that is good for carnivorous plants. Pots are too susceptible to the surrounding air temperature and will not offer enough protection for the plants throughout the winter. In addition to being in the ground, plants should either be mulched or covered with leaves to be more protected from the inclement weather. One solution that I have heard is to cover the Venus Fly Traps with leaves in the fall as temperatures near freezing, then lay a board over them with a heavy stone or bricks on top to keep in place. Another option that I’ve heard growers in Canada do is cover their plants with pine needles. They lay down a burlap sack or other instrument over their plants prior to putting down the pine needles. The burlap sack will allow them to easily remove the pine needles when winter is over. This method has successfully wintered venus fly traps outdoor in zone 4. Provided that steps are taken to help keep the plants insulated, they should survive the winter. The main goal here is to prevent the rhizome from freezing solid. If you aren’t one of the lucky people, and you live in a place where you have extended freezes (hardiness zone 7 or less) and you don’t have a bog garden or other way of planting your Venus Flytraps in the ground, then you will likely have to bring your Venus Fly Traps indoors for the winter. Now, there are a couple of options for wintering the plants indoors. This is the best method if you are unable to winter your plants outside. If possible, put the plants in a south-facing window of an unheated porch or garage that doesn’t freeze. Ideally, the night-time temperature should stay between 32 and 55 degrees Fahrenheit. Daytime highs can get into the 70°F and even 80°F range and flytraps will remain dormant so long as the days are still short. Venus Fly Traps that are in dormancy will still grow, however, the growth will be quite slow compared to spring and summer growth and it is unlikely that the plant will start putting up new large leaves until they are ready to come out of dormancy. If the plant is receiving sun during its dormancy, then it can still perform photosynthesis and this will help keep the plant healthy. Also, since the plant is still receiving sun daily, it will know when to come out of dormancy as the photoperiod starts to extend as spring arrives. Be sure to read the Venus flytrap fridge tutorial if you think you might have to do a refrigeration dormancy. Use this method as a last resort. If you don’t have any other option for a place to winter your plants, or if you happen to live in a place where it doesn’t get cold in the winter, or your days don’t shorten enough, you will likely have to “force” the Venus Fly Traps into dormancy. The gentler the forcing, the more likely your plant is to live through the winter. Ideally, you would decrease the photoperiod over time along with decreasing the temperature in order to send the plant proper signals to start preparing for dormancy. Too sudden a change in photoperiod or temperature might actually kill your Venus Flytrap. Put your plants into the fridge bare rooted. Put your plants into the fridge in their pots. For this method, gently remove the Venus Fly Trap from its pot and dip the plant and soil in distilled water (or other pure water) and swirl it around to remove all of the media from its roots. When you have the entire white rhizome exposed and roots that are free of all soil, remove any parts of the plant that appear to be dead. This should be obvious from the color. Dead or dying leaves will be brown or black. In fact, it wouldn’t hurt to just cut off all the leaves and traps. This will give the fungus much less to start growing on when the plant is in the fridge. Once you have removed whatever growth you feel might cause a fungal problem, treat the entire plant with a fungicide solution by either dipping it or misting it. Now, wrap up the Venus Fly Trap in a damp paper towel or sphagnum peat moss. The paper towel or sphagnum should only be damp, not soaking wet. If you squeeze it and water comes out, that’s too wet. Place the plant in a zip lock plastic bag. Be sure to squeeze out as much air as possible from the bag to limit the risk of fungus and seal the bag tight. If possible, put the bag in the vegetable drawer of your refrigerator. Check in on the plant every week or so throughout the dormancy to ensure that it isn’t rotting or suffering a fungal attack. The Venus Fly Traps and their pots should be put into plastic bags and placed in the refrigerator for the 3 to 5 months. Obviously, this takes up quite a bit of space in the fridge, so for that reason alone, it may want to be avoided. If your fridge is like most people’s, it is probably already full most of the time. Also, Venus Fly Traps that are wintered this way are very susceptible to mold and other diseases, so you will definitely want to use a light dusting of fungicide powder or protect the plants from mold in some other way. This is a must. You will also want to check in on the plants at least every couple of weeks throughout the 3 months or so that you leave them in the fridge to ensure that they aren’t molding. If you just want to enjoy your plant year round and don’t care about killing it, you can just skip dormancy. Venus Fly Traps can live for perhaps a few years without dormancy, but they will eventually start to decline and die. If you can get another plant and just want to enjoy the plant as much as you can, skipping dormancy is an option, though obviously an eventually fatal one. Still have questions about Venus Fly Trap Dormancy?